I was super nervous about how this would taste, but it is a TOTAL WIN! I'm so excited! Please DON'T be intimidated by kefir (pronounced kuh-fear). It's INCREDIBLY easy and WAY better for you than store-bought yogurt. Kefir, technically, is meant to be drunk as kind of a really thick milk. But if you strain it a bit, you get yogurt, which I enjoy a little more, plus I get to use some of the whey from straining it, which I'll say more about at the end. It takes a week or so to rehydrate the grains, and the instructions are in the box. You just put them in milk, loosely cover it, set it on your countertop (or in my case, kitchen windowsill), and change out the milk every day. Easy peasy. Once your kefir is thickening well and has a good smell to it, you can pour the kefir into some cheesecloth over a bowl. Fish out the grains with a spoon. I wish I'd taken a picture of this step, but I hung my cheesecloth with a rubber band from a knob on one of my upper cabinets and kept the bowl under it to catch the drippings. Let it drip for a few hours, depending on how thick or runny you want your yogurt. Mine only hung for about two hours. Side note: If you make the kefir with cream instead of milk and then let it drip longer, you'll have homemade sour cream! Then, scoop it out of the cheesecloth into a bowl, add a generous amount of honey, and taste it. Super yum! It's delish just like this, but you could add fruit, granola, etc. to yum it up even more. The watery stuff that's left in your bowl is whey. You know, like Little Miss Muffet used to eat. It's also REALLY good for you and can be used in a lot of ways. I'm going to start by using this batch to make dilly carrots, but there are a lot of other great ways to use it. Check out this article by Kelly of Faithful Provisions for some great ideas. 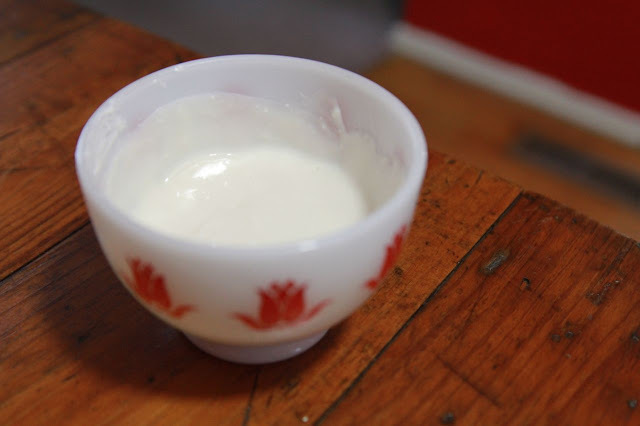 If you're interested in learning more about kefir, Dom's Kefir-Making Site is a wonderful, exhaustive online resource.